The information and quotes for this blog post originally appeared in a Dutch article by Bert Rutkowski. I asked him if I could use his interesting findings and he said yes! So now everybody who doesn’t speak Dutch (and there are a lot of you!) also get to enjoy his conclusions. There are plenty of whisky drinkers out there who enjoy a whisky even more when they know something about the heritage of a distillery. In the case of GlenDronach, the distillery of sherried whisky fame, there is one interesting tidbit that stands out. So what’s that, you ask? That, for instance, there’s a causality between the mothballing of GlenDronach and the true age of their age statement whiskies. The distillery was closed from 1996 until 2001, and that gap of six years forces GlenDronach to use older whisky than necessary. Take a long hard look at the infographic below and see for yourself. The 12yo Original was released in 2009, so should’ve been at least partly distilled in 1997. Except that wasn’t a possibility. So the first batch of 12yo GlenDronach was already actually at least 14 years old. If you bought a 12yo in 2013, you actually got a 18 year old whisky. The same also works for the 15yo Revival, 18yo Allardice and 21yo Parliament. At certain peak moments you’re buying a whisky that is actually six years older than is stated on the bottle. So what are you waiting for? Go on, get to the liquor store and see if there is a 12yo. If you buy one that was bottled in 2013, you actually get an 18yo whisky for the price of a 12yo. And GlenDronach are already fairly priced, so that is a steal! All of the above almost sounds to good to be true, but it is. Firstly because numbers don’t lie, and secondly because it was confirmed to Bert Rutkowski during a visit to the distillery in the summer of 2013. At GlenDronach they are a bit hush-hush about these facts because they’ve had trouble with the Scotch Whisky Association about this in the past. To me there is still one issue, because I find it difficult to understand why they didn’t release bottlings with their true age on the label. Why not just skip the 12yo and go straight to a 15yo release, if that is what your stock permits (or forces) you to do? It might be a case of image building, because they do get great critical acclaim. Let’s just hope that in a couple of years, when they can finally release whiskies with accurate age statements, they are able to produce the same top quality as they do now. We can judge the 8yo Octarine, which is made entirely of whisky from after the re-opening. And that is a pretty good one, especially for it’s age. As stated elsewhere, ths table and its accompanying calculations are inaccurate. Fact is that GlenDronach was mothballed in 1996 and reopened in May 2002, but it would be nice if the calculations had been properly verified. A 15 Revival bottled in April 2013 can be guaranteed to be made with whisky distilled no later than 1996, making it a guaranteed 16 year old, not 18. If the distillery was mothballed before April 1996 (and I can’t find any information about the exact date) then it would still only be a guaranteed 17 years old, not 18. The same error is made with the other calculations. isn’t that the same with all whisky? not sure what u mean. what is the % of 18 yo whisky in the 12 yo for example? Gal, right now the 12 and 15 have to be made entirely with whisky from 1996 or before, since there is no GlenDronach distilled between somewhere in 1996 and May 14th 2002 and the whisky distilled in the new era hasn’t yet reached 12 years of age, let alone 15. Therefore, 100% of the whisky used for both the 12yo and 15yo was distilled in 1996 or before, making early 2014 bottlings 100% 17yo and older. They chose to not label it as such, but they could by now label both as at least a 17 (2014-1997). I have thought of the same topic the other day: The actual age in the bottle may be even older as the conclusion in the article. As the graph shows this age calculation is only valid (exept the true comments already given) if all the whisky in the “stretched” years comes from 1995, which I would doubt. That would put too much pressure on the year 1995 and stock as mentioned in the article would not be sufficient to fully cover the “closing period problem”. As mentioned the new owners have aquired a lot of stock from multiple years. I would therefore think that they fill recent bottlings of e.g. 15 Revival not only with 1995 barrels but mix even older to balance out the existing stock levels. By the way, what I have forgotten to mention and has to be considered for the upcoming whiskys that are distilled after the closing block: From 2005 to 2008 the whisky has been barreled in ex bourbon casks without exeption under der Pernod regime! So even if the whisky will reach its “real” bottling age after the reopening – for example the 15 year old in 2017 – it will not be a purely sherry cask matured! The character will therefore differ from those today. In addition the heating was changed from direct coal to indirect steam heating, which has an effect on the character as well. Not worse – but different. 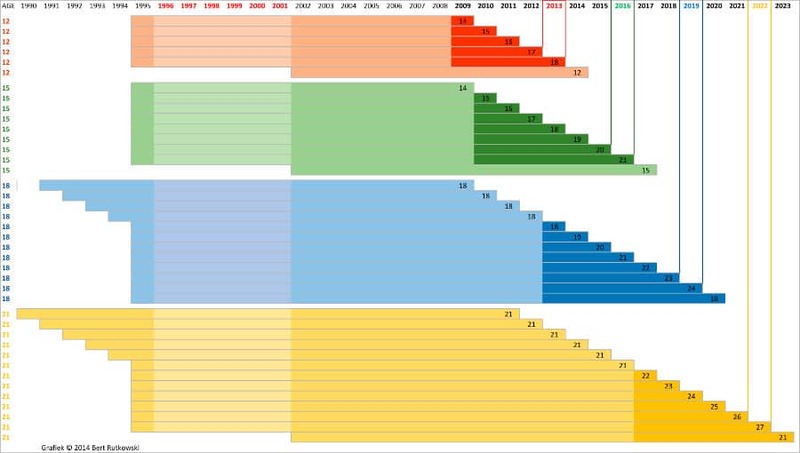 The only problem with the chart is that it is off by a year (should be one less). for example, Glendronach 12 year – If it was made in April 15 of 1996 (right before closing), would be 13 year old on April 16, 2009. I think if the bottling date says 2013 on it you will be getting older whiskey than is listed as the age statement. So the question that needs to be answered is how can you tell what year a particular Glendronach was bottled? Where is the bottling date stated because I cannot find anything. Please and thanks. Hi Brent, if you take a closer look at the photo’s in the article, you’ll see that one of them is of a date stamp. 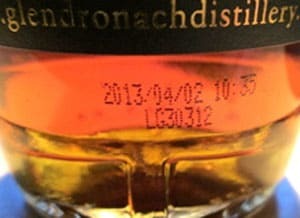 This date stamp appears on all bottles of Glendronach and will tell you when it was bottled. Thanks for the information. I was busily looking at the front and back labels and the tube, never at the bottle itself (or the picture in the article, duh). So in theory for the 12 year old, anything bottled prior to May 2014 would have to be from the pre-moth balled stock, right? Is the date code on the bottle definitely the date the whisky went in to glass? (as opposed to the date the glass bottle itself was made, or something). I have bottles from a Feb 18, 2014 bottling, which I believe would force it to be older stock. Interesting article, thanks for sharing. As pointed out in the comments above, a one-year correction is required for the chart. But the underlying analysis illustrates a key feature of whisky production – and the commonly misleading nature of age statements on single malts (i.e., they are only a minimum, representing the youngest whisky in the vatting). Good to see someone point it out in a clear, explicit example. I don’t think the distillery would chance a change in the Revival as it became an instant hit. My hunch is that regardless of bottling years, the planners used the same casks and calculations to ensure the latest bottlings eere commensurate with the first bottlings. It surely was known when the distellery was reopened that the masters knew how many bottlings they could acheive over the years. The reason the Revival is no longer being bottled is proof positive they were using the same stock from the start and simply cannot replicate the current bottling for lack of the original casks. The chart is pure speculation. Taste a bottle of each year and you have the same product. Of all the bottlings, the Revival is the least likely to have been molested and most likely served to carry the torch as long as original stocks could sustain. Thank you Glendronach! What a great run! Glendronach also wouldn’t have bottled the Platinum as in my bottle 2014 with 16years, when it would be older. Wouldn’t make sense. I share the intension of Engine66. Nevertheless Glendronach produces really good whiskys. interesting article. Regardless of the age statement, GlenDronach is a really great whisky. I bought 3 of 2015 bottles, and 1 most recent 2017 bottled one, the observation I got is that all 3 of 2015 bottles has darker juice than the most recent 2017 bottled. What happened with the 21 year old . colour of new bottlings is pale in comparison to old ! 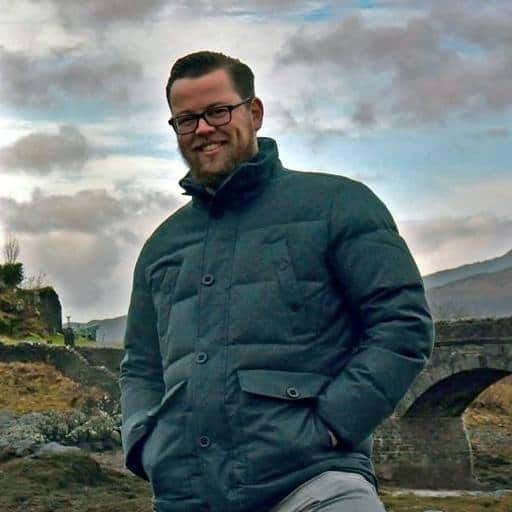 Words of Whisky is the blog of Thijs Klaverstijn, a freelance writer and journalist from Twente, a region in the east of The Netherlands. He's been drinking whisky for quite some time now, but a visit to Scotland in the summer of 2013 has turned his love for whisky into somewhat of an obsession. This blog serves as an outlet for that obsession.